"Second Wind" boasts 6 bedrooms, 6.5 bathrooms, to comfortably accommodate 20 in this upscale home. 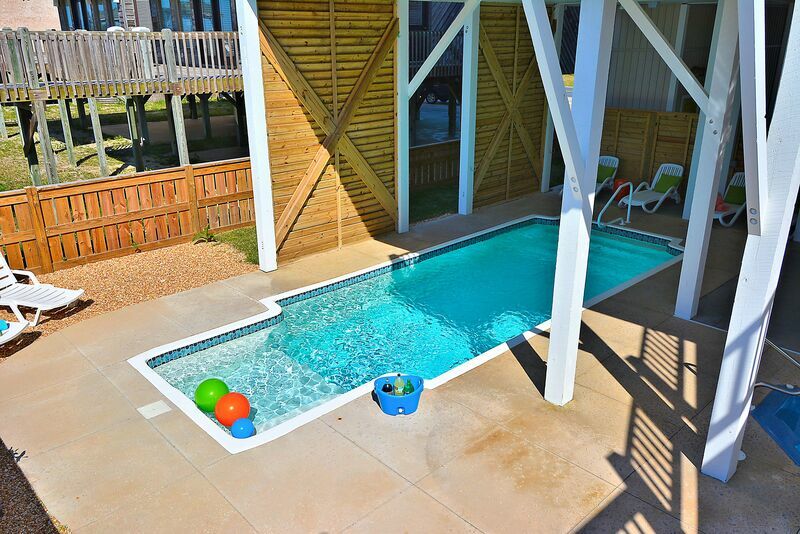 Enjoy the private pool and hot tub, an exterior tiki bar, plenty of outdoor seating and dining. Gas grill. Outside hot/cold shower available for your convenience. Private walkway to beach with a gazebo. First floor has an open living area with a gourmet kitchen with stainless steel appliances, granite countertops, and two of everything to make cooking and entertaining easy for a large group! Living room has a fireplace, two comfortable couches and a large flat panel television and entertainment center. A wet bar, wine refrigerator, and ice maker are added touches. Each bedroom has its own private bathroom and television. Bedroom configuration: two on main level - a king, with handicap friendly bathroom and shower (non-ADA compliant). Second bedroom has 2 queens. Upstairs: 2 suites with king size beds, jetted whirlpool tubs and seperate showers; two bunk beds and one trundle bed (6 singles) with private bath; queen/trundle. Other amenities include ceiling fans throughout, hardwood floors throughout, washer and dryer on each floor, wireless internet access, premium cable with Showtime, and an elevator to all floors. Hot tub heat included in weekly rental. Heated pool is $100/day in May or Sept. This second year we have rented this house. Let me say first that we are 9 mature women who have come to Ocean Isle since the late 90's. We have stayed in many homes over the years. This home is by far the best that we have stayed in. First of all the elevator don't know how we managed up till now without one. The only thing you need to remember though is that the accordion door needs to be closed before you shut the main door. Moving on to the kitchen VERY WELL APPOINTED. We had to decide that one of the fridge was for drinks and the other for food or we would go crazy going from one fridge to the other. Pots. pans. dishes, glasses silverware is clean and in great shape. You don't need to bring any unless you have a favorite pan/pot. Bedrooms are clean and comfortable rooms are big and roomy. Plenty of Ice and great wet bar. You can't go wrong with this house. We will be back next year!!!! Same time same place! The whole family immediately feel in love with this house. It was perfect for our family of ten adults and three children with room to spare. The pool and hot tube are in the perfect spot for when you want to get out of the direct sunor rainbut still be outside playing. The kitchen has everything you need. We cooked in it everyday and it was nice to have two oven/stoves, dishwashers, fridges, and it even has two coffee pots, a regular one and a Kureg. This house is spacious enough to have privacy if you need some alone time. The whole family really enjoyed being together in this very comfortable house. We hope to come back again in the future.